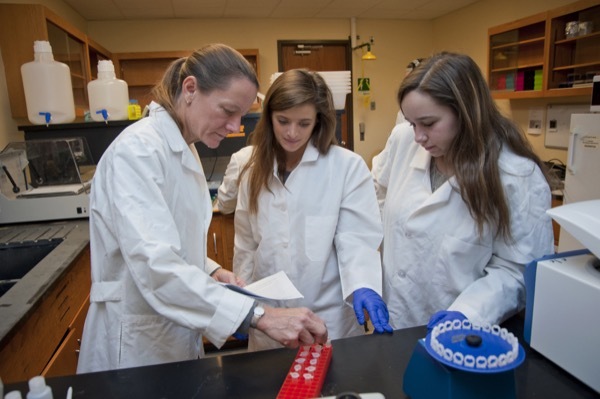 Amy Biddle (left) works with student researchers Hailey Seigel (center) and Barbara Hahn. 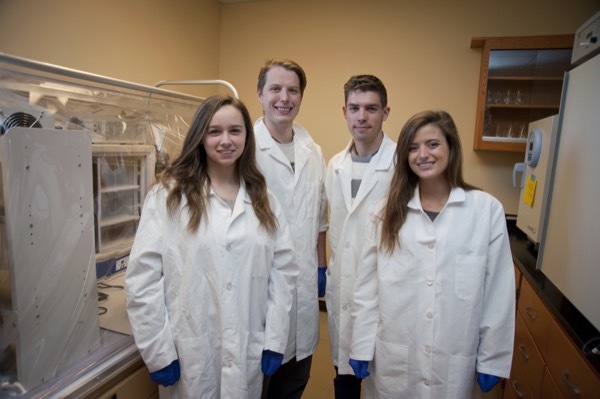 Pictured are Biddle Lab student researchers (from left) Barbara Hahn, Justin Berg, Brian Chambers and Hailey Seigel. 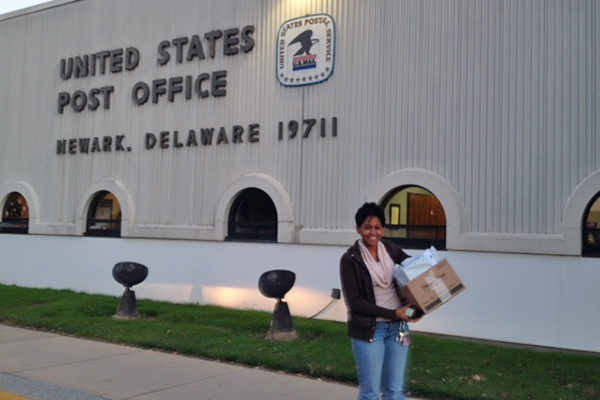 Horse owners mail kits to UD for testing. Maryn Jordan sends out kits. 12:57 p.m., Oct. 23, 2015--Researchers at the University of Delaware are looking to horse owners across the country for help as they try to tackle the fundamental questions behind the role of bacteria in the horse gut with regard to health and disease. 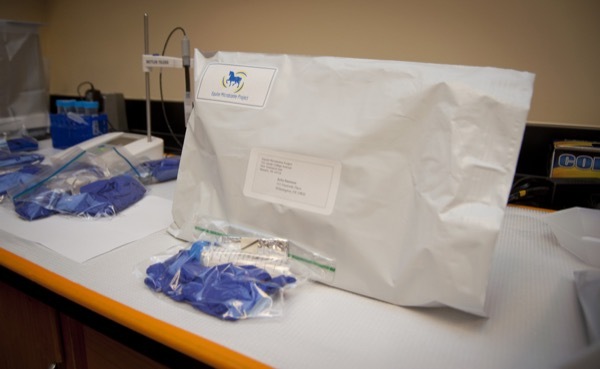 The Equine Microbiome Project is led by the Biddle Laboratory in UD’s Department of Animal and Food Sciences (ANFS) in the College of Agriculture and Natural Resources (CANR), and the project is highlighted as part of the Development and Alumni Relations Crowdfunding site. Amy Biddle, assistant professor of animal and food sciences, said that gut health is of the upmost importance to horses. For horses, a belly ache can be a life-threatening event. Colic is the leading cause of death after old age and laminitis causes irreversible lameness. Both conditions are associated with changes in the bacteria in the hindgut due to factors such as dietary disruption, seasonal changes, stress or age. Both can be chronic, creating management challenges for horse owners and veterinarians. In just two weeks since starting the project, the lab group has sent out 36 of kits to states ranging from Massachusetts and Virginia to Oregon and California, and there is a waiting list of people who are interested in submitting samples. They have asked owners who provide samples to also provide them with metadata on the horses, information such as the horse’s history, any medication it has taken, exercise habits, and what the horse eats. They are hoping to get samples from hundreds of horses across the country and as samples come in, they will extract DNA and do sequencing to correlate those sequences with the data that they obtain from the owners. The horses will then be grouped by age, gender, breed, geographic location, diet, exercise and stress level. Among the questions they are trying to answer is what the “normal” gut microbiome is for healthy horses and if the gut microbiome changes as horses age. As the website explains, identifying the microbiome differences associated with health and disease is a necessary first step to designing therapies and/or interventions to restore balance and function to the digestive system of colicky or chronically laminitic horses. The lab group is made up of six undergraduate students and a volunteer. The students include Maryn Jordan, Brian Chambers and Hailey Siegel, all juniors in CANR, and Jessica Spleen, Barbara Hahn and Justin Berg, CANR seniors, and Candy Curro, who volunteers with the project. Biddle added that she hopes the project will lead to summer scholarship opportunities and undergraduate research projects as students have a look at the data and come up with their own hypotheses to test. For more information or to donate or participate in the project, visit the group’s UD Crowdfunding site.